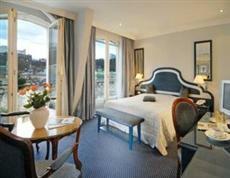 The Bristol Hotel Salzburg is a five-star Salzburg accommodation located in the heart of the Old Town. Many famous places of interest are within walking distance of the hotel, including Mozart's birthplace, the River Salzach, the Hohensalzburg Fortress, the Mirabell Castle and Gardens, festival halls, and the Salzburg Cathedral. The Salzburg airport is located a mere six kilometers from the Bristol Hotel Salzburg. Travel may be arranged by public transport or taxi service. Most points of interest are within walking distance from the hotel, and bicycle paths are plentiful. Sightseeing tours often provide shuttle service from hotels. Each of the sixty guest rooms at the Bristol Hotel Salzburg offers an en suite bath with hair dryers and complimentary toiletries. All rooms are equipped with cable television, mini-bars, alarm clocks, and Internet connections. As one of the first guesthouses in Salzburg to receive electricity, the Bristol Hotel Salzburg has been extensively renovated to offer modern amenities. Boutiques, a jeweler, an optician, a hair salon, and a travel agency are all located on site. The hotel also offers 24-hour reception, a gourmet restaurant, and a bar. Business travelers may avail of the conference center and the high-speed Internet access.